We had a Super Bowl party at our house this year, but I just came for the food. Well, ok, time with family was part of it too. But I really don’t see the point or attraction of football. I can think of about nine million other things to do besides watch football. Like eat yummy foods. That’s always way more fun than organized sports for me. If eating was an organized sport, I’d be its Number One Fan. I’d paint my body in team colors and have one of those big foam hands…holding a fork, probably. I would be all “Go Team!” and follow the event like it was the most important thing to ever happen in all of history. So what does this have to do with Low Carb Baked Cheesy Beef and Pepper Dip? It was my contribution to the evening’s smorgasbord of delights. And, I might add, it was a basket…or goal…or touchdown…or whatever it is you yell when your team gets a point. It was good! When you’re trying to make choices that fit with your healthy eating plan, making something yourself is the best bet. Sure, I could have bought some pre-made concoction instead of making it myself. It would have been one less thing to do in preparation for welcoming guests into my home. While babysitting my two year old grandson. Who was in fine form that day. But he’s sooooo cute! 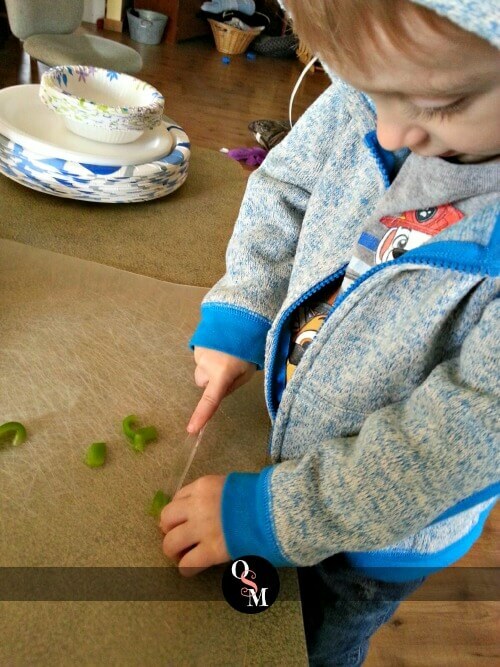 And he did help me cut the peppers for the dip. A most important job! He calls me “Amma” and I heart him! He’s a great little sous chef. This creamy, baked cheesy beef and pepper dip is super easy to make, even between your sous chef pulling things out of the cabinets and the loony lab puppy doing her crazy antics. If I’d really been on the ball, I would have mixed this up the night before and got it all ready to bake. I did not, but it was still super easy to make. Just mix all the stuff together, put it in a baking dish and bake it until it’s hot, bubbly and golden brown on top. You can do that even when chaos is reigning all around you. Trust me on that one! But if you do think ahead, mix it up and throw it in the fridge until it’s time to bake it. Trim Healthy Mamas, this one is a glorious S.
While those crackers will taste wonderful, a better way to eat this dip is to use veggie dippers, like fresh bell pepper strips, green onions and celery, or homemade flax or other practically zero carb homemade crackers. You’ll find some great recipes in the new Trim Healthy Mama cookbook! 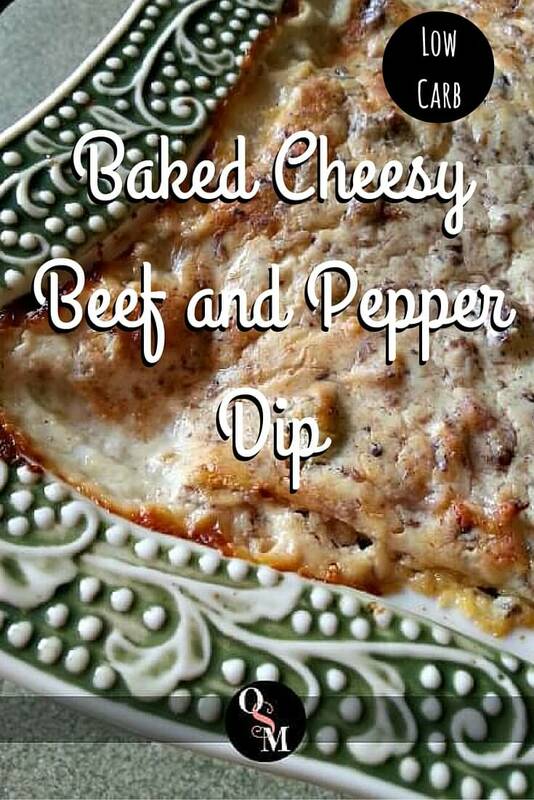 You know what else you can eat this yummy Cheesy Beef and Pepper Dip with? A spoon. No carbs to worry about there, let me tell you. When I originally came up with this recipe, my mind was thinking “Philly Cheesesteak Dip.” After sitting down to craft this post and doing a bit of research, I realized that this is NOT a Philly Cheesesteak dip! Not being from Philly, I had no idea what a genuine Philly Cheesesteak really was…so I read about authentic Philly Cheesesteaks. Turns out that they are traditionally made with either Cheez Wiz (which I can NOT endorse in any way, shape or form! 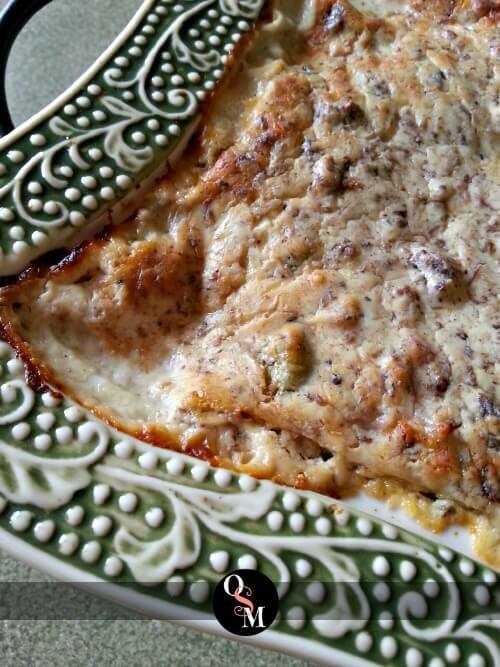 ), American or Provolone cheeses and come either with or without fried onions. I’m still thinking about Philly Cheesesteak Dip though, so I’ll be working the magic in the Oh Sweet Mercy kitchen to see what I can develop. Because I love cheesy. Probably way too much. Don’t you? Let’s make some Low Carb Baked Cheesy Beef and Pepper Dip! 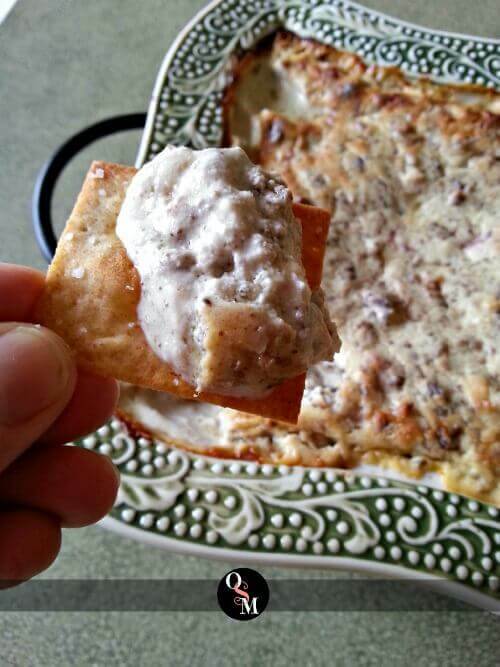 This rich, creamy, Baked Cheesy Beef and Pepper Dip is perfect for parties. 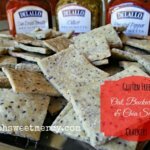 Trim Healthy Mamas, use low carb dippers or even better NO carb dippers like non starchy veggies (or a spoon, those are gluten free, too!). This dip is so good, no one will know it's "diet" food! Bet it was a hit! Whoa! I want to eat THAT! Yum! That looks amazing! Such a fun dipper! Yum!! That sounds so good! Fabulous. Sounds like it’s right up my alley! What is a can of beef? What kind of fresh beef do you recommend for this recipe? Thin sliced grilled beef like Philly sandwiches? Canned beef is normally found near canned chicken, at least in my area. We have large cans of beef chunks available. You could use any kind of beef, really. I had a can of beef on hand so I used that. If I didn’t I wouldn’t be afraid to try browned ground beef or shaved beef like for Phillies. Leftover beef roast would also be great! I will update the post. Thanks for stopping by! The beef I used was canned beef chunks, normally found near the canned chicken in our area grocery stores. 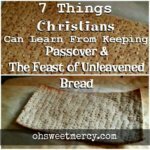 If you can’t find that, you could easily use leftover beef roast, browned shaved beef (like for Phillies), or even ground beef. Thanks for stopping by! I’ll add this info to my post.